This variation of the classic Italian dessert has just the right amount of eggnog flavor, assembles easily and is perfect for your holiday dessert table. Prepare mousse mix according to package directions using 1 cup eggnog instead of milk. Beat cheese into prepared mousse. Combine coffee and brandy in small bowl. 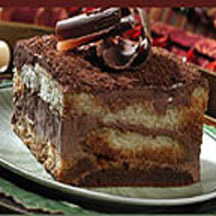 Line bottom of 8-inch-square baking dish with half of ladyfingers; drizzle with half of coffee mixture. Spoon half of mousse mixture over ladyfingers; top with remaining ladyfingers. Drizzle with remaining coffee mixture. Spoon remaining mousse mixture over ladyfingers. Sprinkle with chocolate.